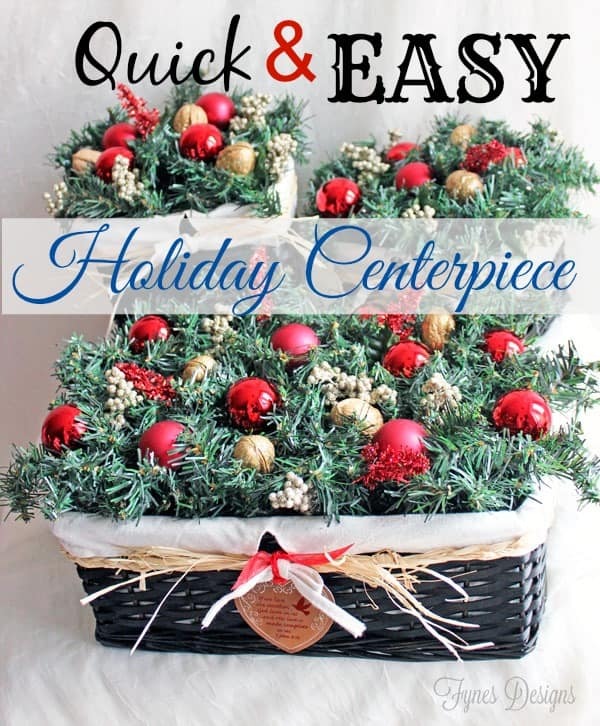 For Christmas, as part of a sponsored post for Collective Bias® I made these easy Holiday Centerpiece baskets using craft supplies purchased at Walmart to help give back to my community. Each year at the Christmas my family and I like to think of a small way we can give back to our community; even if it is something small like donating to the food bank, helping a senior get out and about, or spend some time sharing our company with a person that might need a friend. When this opportunity came about to give back to the community with the help of Walmart, I knew exactly where I wanted my donation to go. There is a local ministry in our area the Lords Ranch Ministry the farm uses animal-assisted and modern therapeutic programs to help women and children who have experienced abuse or abandonment. The charity helps these women with a safe place and supports various individuals and families through spiritual principles. The owner of this facility gives so much, I thought a holiday centrepiece may lift her spirits and show her work is not gone unseen. Plus, I had loads of supplies to make two additional small centerpieces, that would be perfect for her to share with a family that may need someone thinking of them at the holidays too. I purchased $30 worth of craft and holiday supplies from Walmart. 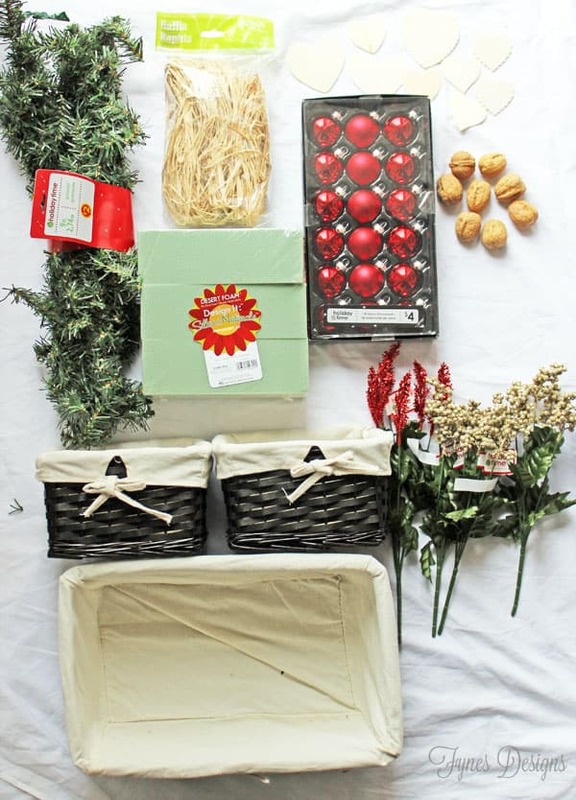 1 set of wicker baskets ($12), bough garland ($2), raffia ($2), glass ornaments ($4), walnuts ($2), floral foam ($5), wreath picks ($4). Hot glue floral foam into the basket. Using side-cutters, snip small sections of the garland (approx 6″ long). Poke the garland sections into the floral foam, until the foam is no longer visible. Snip a length of wire and run through the hook of a glass ornament. Poke wire ends into foam, embellishing with ornaments. Poke a bamboo BBQ sewer into the wide end of a walnut. (I painted my walnuts with glitter paint I had leftover from my Glitter Holiday Painted sign). Poke skewers into foam. Add small sections of the wreath picks to fill in any bare spots. Take a few strands of raffia and tie around the lip of the basket. 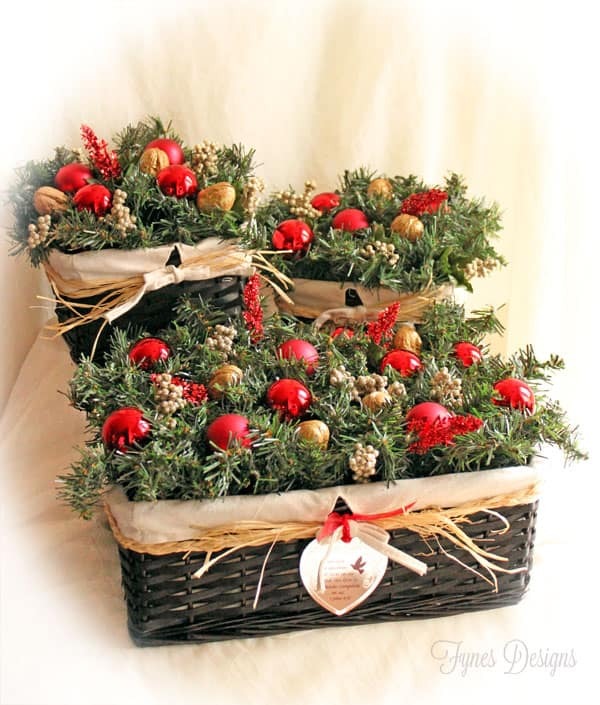 Hang a small ornament from the front side of the basket. 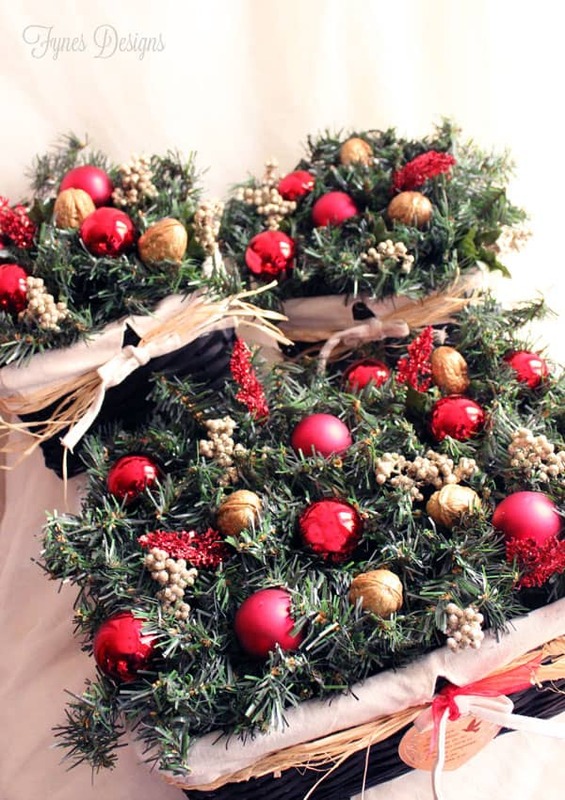 Can you believe how easy this Holiday Centerpiece is to make?! 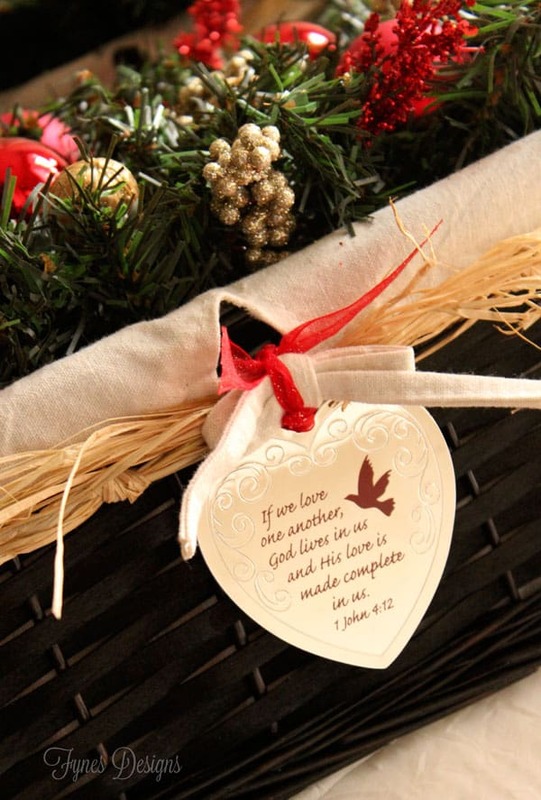 I thought this Christmas ornament was the perfect way to share the love with my gift. 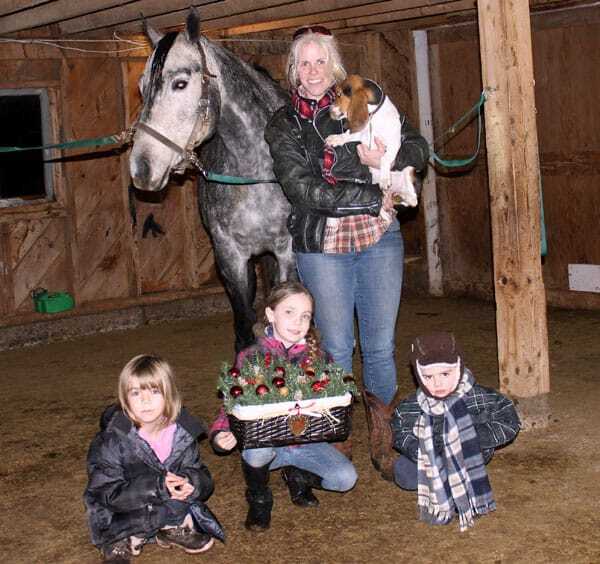 I shared my gift with Lisa of the Lords Ministry Ranch and she was so pleased that I thought of her, she is pictured below with children and one of her trusty steeds. A big thanks to Walmart for making my giving back gift possible. How does your family give back to the community during the holidays? I’d love to hear your ideas! Gorgeous and timeless! It’s so beautiful. You did an amazing job and what a great gesture to do at Christmastime.